"If roads are considered the skin of a community, then a road is to the public body what skin is to the private body. If people mark their skin as a means of commemoration, communication or ritual; then a road can be marked for the same reasons." That's the philosophy behind artist Steed Taylor's unique art form: road tattoos. The most recent venture for Steed Taylor is the "Daughters and Sons Knot," a proposed road tattoo to be located on the 800 block of Vermont Avenue N.W. (between H and I streets) bordering Lafayette Park and McPherson Square. This is an area rich in history, dating back to both the Revolutionary and Civil wars, during which Lafayette Square and McPherson Square received their names honoring a war hero and a Union general. Today, Taylor hopes the piece of art will bring "Washington's past relationship with war and loss to the present day by honoring D.C.-area soldiers recently killed while serving their country by using their children's names in the piece." The road tattoo will be a volunteer effort resulting in the finished product, a 60-foot-wide, 300-foot-long Celtic knot to represent community interdependence. Taylor, currently a resident of New York City, has received both national and international acclaim. 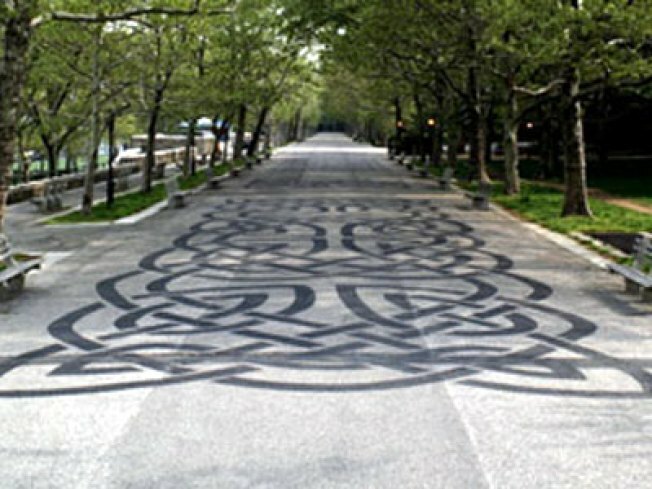 His work has included road tattoos in North Carolina, New York, Arizona and most recently Beijing, as part of the 2008 Beijing Chinese Biennial. For anyone interested in volunteering or just watching Taylor in action, the road tattoo installation will take place this weekend, July 24-25, from 7 a.m. to 6 p.m. If you're going to volunteer, prepare to block out two hours of time and wear old clothes because you'll be painting. Water and snacks will be provided, however. Contact info@galleryplanb.com or steed@steedtaylor.com for more information.